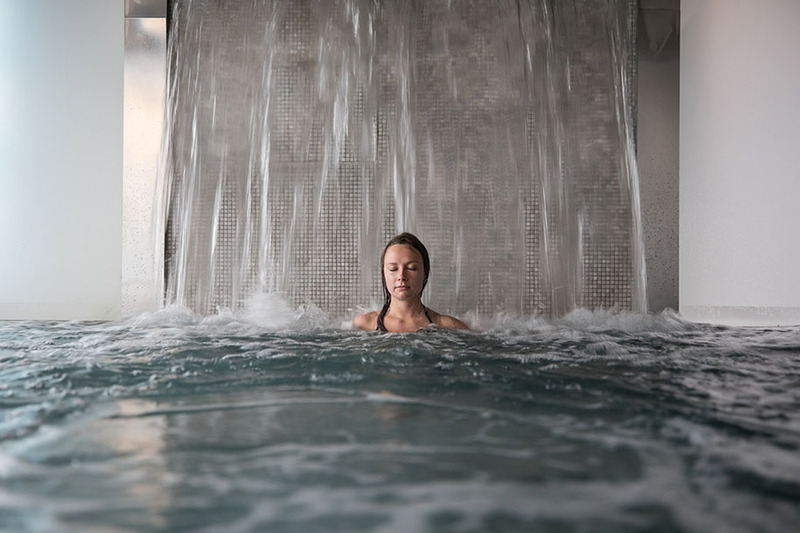 Travel to Quebec or Montreal to experience the bath circuit’s healing powers. Traditionally, Nordic spas are known for their bath circuit, which involves alternating between heat (in a dry sauna, whirlpool, or eucalyptus steam bath) and cold (taking an icy plunge in a river or pool, or a cold shower). And though they started in Scandinavia, at some point they migrated west to Canada. According to a recent study from the University of Eastern Finland, the Finnish sauna, andsimilar experiences like a eucalyptus steam bath and hot bath sessions, can increase blood flow to the skin and muscles. On the flipside, a study from Virginia Commonwealth University found that as little as seven minutes in 60-degree water can also increase blood flow, in addition to ramping up white blood cell count and kicking the cardiovascular system into high gear, thereby boosting metabolism. 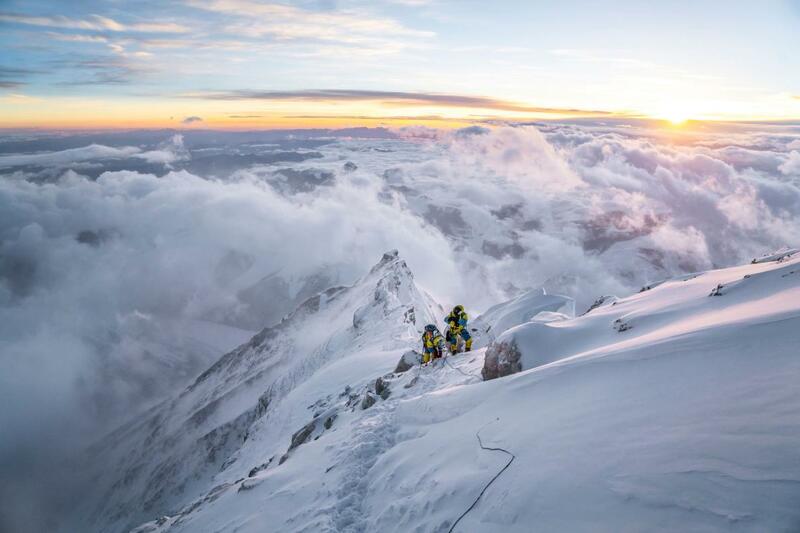 Alternating between the two may have even more perks for athletes as doing so creates a “pumping” effect in the muscle tissues which can assist in clearing out metabolic waste. From urban havens in the heart of major cities to snow-covered lodges nestled deep in the woods, here are six of the best Nordic spas in Canada. After opening its doors in 1964 in the Laurentian region of Quebec, The Polar Bear’s Club can be credited as the inspiration for the trend’s continued growth throughout the country. 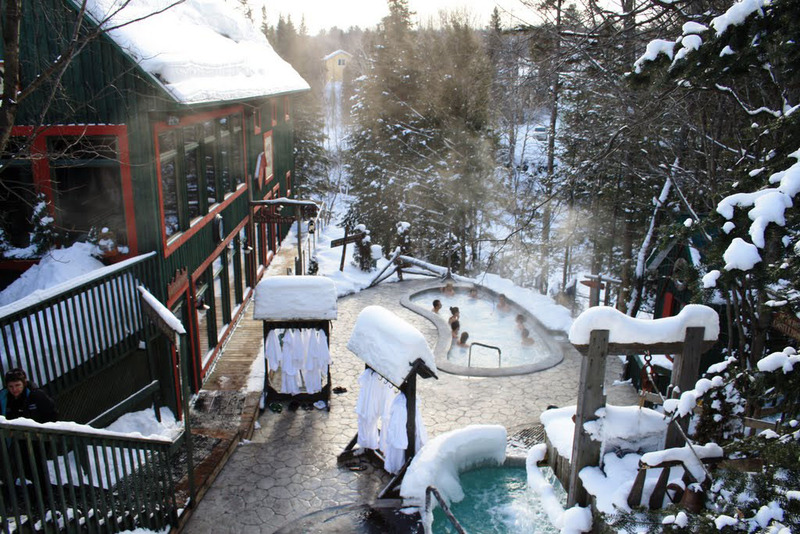 Here, the charming ambience of Sainte-Adéle village and the nearby Rivière à Simon (ideal for a cold plunge during the winter) perfectly complement the property’s thermal pools, dry saunas, steam baths, and outdoor therapeutic whirlpool baths. Make an overnight out of your trip by booking a stay in a loft or villa in The Polar Bear’s Club Spa Hotel. Tucked among the cobblestone streets of Old Montreal, Scandinave Spa Vieux-Montreal is a welcome respite from the hustle of the city. Inspired by the traditional Scandinavian public baths, Scandinave Spa specializes in water circuit therapy, starting with a 10- to 15-minute body-heating period through a eucalyptus steam bath, Finnish sauna, or whirlpool to cleanse the skin, a cold rain shower or cold plunge for 10- to 15-seconds to close the pores and 15 minutes in a room that’s set to a comfortable temp to allow the nervous system and cardiovascular system to regulate. For optimal relaxation, the entire circuit can be repeated three times and enhanced by a Swedish or Lomi-atsu (Hawaiian Lomi-Lomi and Shiatsu fusion) massage. The tranquil spa environment follows a strict code of silence, intended to provide an even more restorative experience. Housed in a ferryboat anchored in the Old Port of Montreal in the St. Lawrence River, the floating 25,000-square foot Bota Bota spa features charming design touches like 678 portholes and five sundecks, where guests can sunbathe or enjoy whirlpool baths, all while taking in sweeping views of Montreal. Though the Nordic bath circuit is offered, the signature Bota Bota massage choreographed to live harp music is the standout experience. 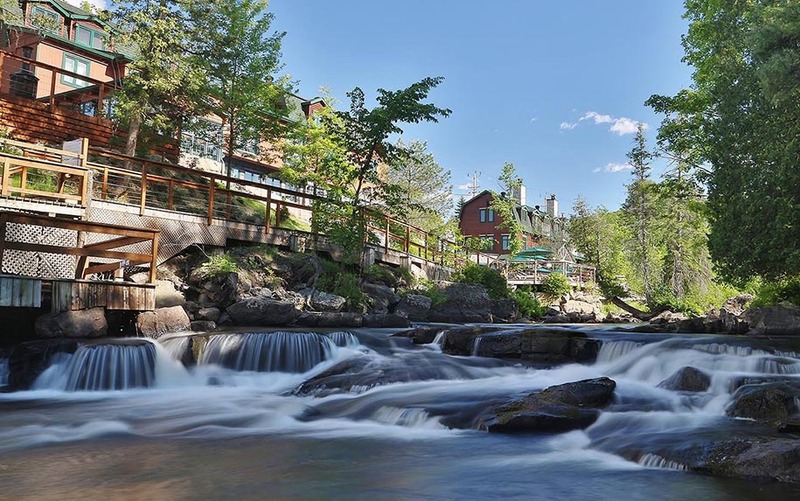 Resting along the banks of the Castlebrook River in the resort town of Magog, Spa Nordic Station is surrounded by thick vegetation, creating a peaceful getaway. Nordic bath “profiles” (athlete, immuno-boost, and detox) help customize your experience. Once they’ve decided, guests have the option of enjoying the heated portion of their bath circuit via a Finnish sauna or steam crypt, or by warming up in the outdoor hot tubs. Take advantage of the surroundings and cold plunge in the Castlebrook River instead of the manmade cold plunges, guaranteed to be particularly invigorating during a wintertime visit. Relax on two outdoor terraces, or inside by the fireplace with panoramic views. 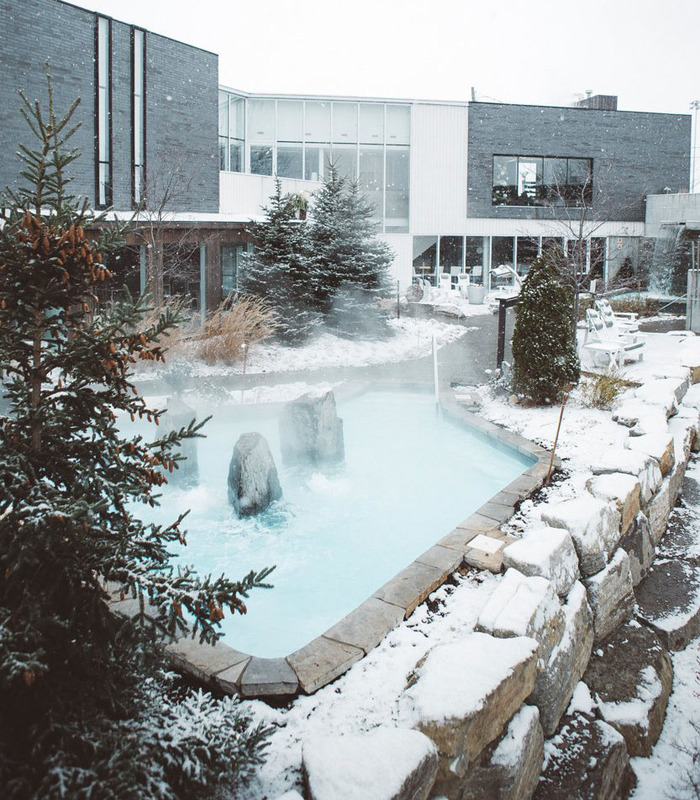 City dwellers can take a quick trip from Montreal to Nun’s Island for a getaway to Strøm Spa Nordique that feels worlds away. Although Strøm spa doesn’t have the same rustic vibe as its Nordic spa counterparts, the clean lines of the edifice and impeccable landscape exude tranquility and serenity. While the thermal bath experience and more than 25 face and body treatments are offered, consider staying afterwards on a Thursday or Friday night, when a DJ spins while guests enjoy wine tastings and gourmet snacks. 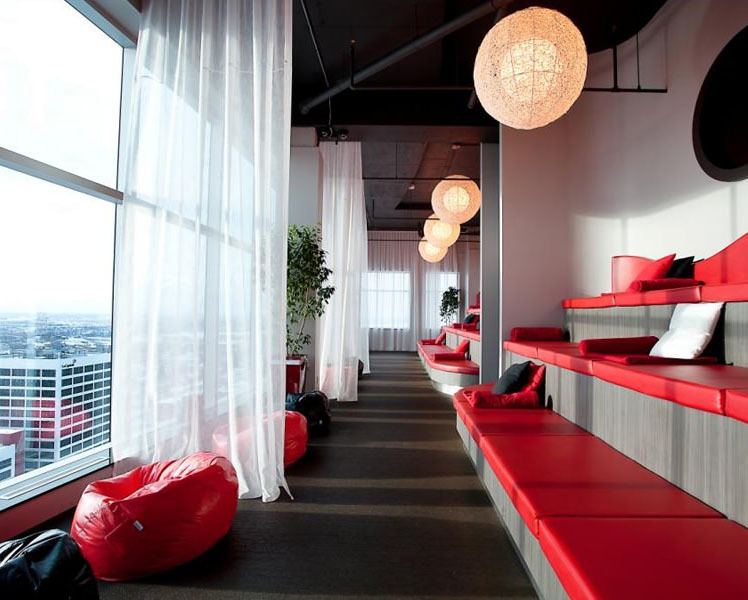 Elevate the thermal bath experience, literally, at Sky Spa, located on the 17th floor of the Jules-Dallaire Complex. Although one can choose to start the circuit in the beautifully tiled steam room, it’s best to take advantage of the rooftop location by soaking in the bubbling, outdoor California hot tubs overlooking the St. Lawrence River. Oversized windows in treatment rooms, Finnish saunas, and the Bistro frame equally breathtaking vistas.